Wrapped in paper and packed in a box, with tuning key and a “How To” guide. This beautiful lyre is made of maple wood and has seven strings (notes d' - e') tuned in a pentatonic scale. Dimensions: 38 cm high x 16 cm wide. 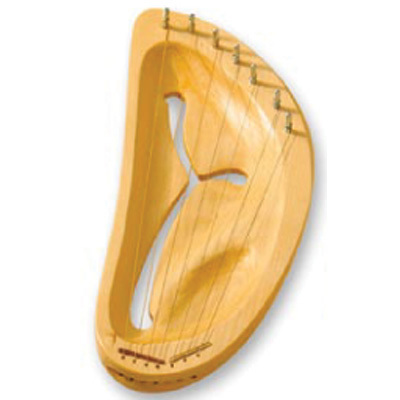 Lyres are carved into an open shell shape from a solid piece of hardwood maple. The body is carved with antler like openings, which increase the resonance of the wood, and influences the sound and vibration of the body. The vibration is a gentle, quiet sound that calms and opens the mind especially if you hold the lyre close to your body and feel the resonance. The sound is familiar to us yet reminds us of ancient times. The lyre is the ancestor of the harp. They were very popular in the Celtic cultures of Scandinavia, Ireland, France and Lithuania. It is thought that their form may have been adopted from Greek or Armenian mythology. Variations of Lyres and Harps are also used in Africa. It can keep a group of children spellbound if the lyre starts singing. Wrapped in paper and packed in a box, with tuning key and a “How To” guide. This scale spans over five whole tone steps and is built up by an open fifth tuning. A clear and light-filled sound, carried by the material's own tone quality. Dimensions: 38 cm high x 16 cm wide. Designer: Kjell Andersson. This lyre is designed to be held in the left hand with the longest strings next to the body and played with the right hand.